It probably should be "books on my nightstand" but I broke the leg off my nightstand and haven't managed to repair it so we will go with this. Though honestly something like 'books strewn around my house so I can't find them when I want them" would be more accurate. The Blitz by Juliet Gardiner. I am really fascinated by the social history of WWII particularly in relation to England. I am really not sure how or why this interest began. I have been sitting here trying to remember and I just can't. I am sure it began with a book at some point but this interest is so long-standing I can't remember the source. Possibly my mother reading An Episode of Sparrows by Rumer Godden aloud when I was a child. That book made a big impression on me. 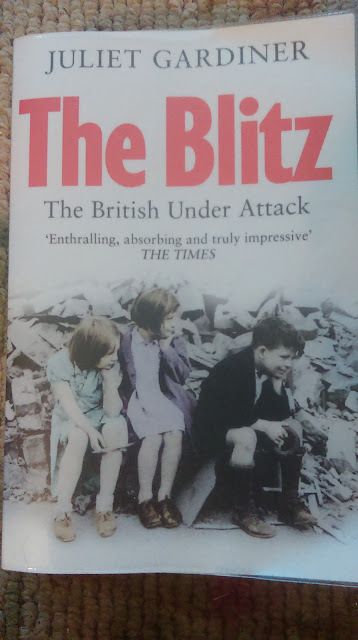 Anyway, I am finding The Blitz fascinating and horrifying all at the same time. I only started it yesterday so I haven't gotten that far. The Last Lion by William Manchester. My father recommended this. It is about Churchill during the years 1932-1940. It is more straight up history than I usually read but it is interesting. It goes well with all the social history and fills in a lot of the gaps in my knowledge. 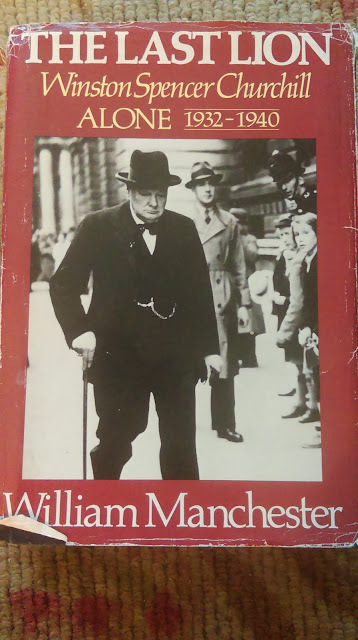 Churchill was a fascinating and unusual man. I have been reading this off and on for a while. I get bogged down in it sometimes and have to take a break. The Law and the Lady by Wilkie Collins. Everyone needs a little sensational literature to provide light relief. Valeria marries Eustace against everyone's wishes and then discovers on their honeymoon that he is harboring a dark secret. Drama ensues. The Ginger Griffin by Ann Bridge. Amber leaves England and an unhappy love affair behind and goes to Peking to stay with her uncle who is a diplomat. Adventure ensues. My guess is she also has a happier love affair but I haven't gotten to that yet. So there you have it. I think I should resist the urge to start another book and finish one of these instead. I don't have a picture of the Wilkie Collins because it is on my Kindle and I am not sure you really need a picture of that. You know what a Kindle looks like. The Ann Bridge I am reading on my laptop using Scribd. I have very mixed feelings about that. On the positive side, all the books! For only $8.99 a month! Hurray! On the negative side, I really hate reading on my laptop. I don't feel like I get as caught up in a book and my eyes get tired. I keep thinking I will cancel my subscription but then I find another book I really want to read. I wish I could just afford to buy all the books I want. I'm currently reading 4 books too. I've been working my way through The Silmarillion by J.R.R. Tolkien for months now, and I'm also reading Dauntless by Dina L. Sleiman and re-reading The Bourne Identity by Robert Ludlum. And I'm re-reading Hamlet and hosting a read-along of it on <a href="http://www.theedgeoftheprecipice.blogspot.com</a> my book blog</i>. I usually try to only be reading 2 things at once, one upstairs and one downstairs, but sometimes books come in at the library sooner than anticipated, etc. Nice to "meet" another book blogger who reads multiple books at once! I just picked up that Tolkien for my son. It was on the free book rack at the library. I usually have only two books going as well, one that is light and easy to read for when I am tired and then one heavier one for when I can concentrate. I seem to have gotten a bit carried away lately though. Nice to "meet" you too! Yes, lately it seems like I've always got a book going that is almost like homework, something very light, something medium-weight, and then sometimes I just get consumed with the desire to reread a book and start even though I have other stuff going, which is what happened with The Bourne Identity.